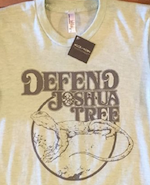 All proceeds from the next 50 sales of this Men’s Large ‘Defend Joshua Tree’ T-shirt go to the continuing effort to keep Dollar General out of beautiful Joshua Tree! Help courageous Joshua Tree residents pay the legal fees in this epic David vs Goliath battle, now in its fourth year! This is MEN’S LARGE only — this size fits most folks! Each shirt is $20 plus postage. Each T-shirt is manufactured by American Apparel and screenprinted by hand with the fierce Arik Roper three-coyote design. DEFEND JOSHUA TREE. Before it’s too late. This entry was posted in Dollar General, Joshua Tree Downtown Business Alliance and tagged Dollar General, Dynamic Development, Joshua Tree Downtown Business Alliance, Kerri DePierro. Bookmark the permalink.